Many birdwatchers turn to butterflies during the quieter Summer months, as most species are fairly obvious and relatively easy to find. But the Hairstreaks are a much harder group to observe. They rarely visit flowers, feeding mostly on honeydew secreted by aphids. 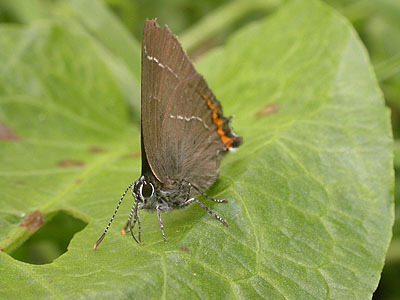 Hairstreaks are tree-loving butterflies and Nottinghamshire has three breeding species - Green Hairstreak, Purple Hairsteak and the White-letter Hairstreak. Males of both set up territories at the tops of Oaks and intercept passing insects and other butterflies, in their search for a female. This makes them very difficult to see at close quarters, but with patience and a little luck, these delightful butterflies can occasionally be observed on the ground. White-letter Hairstreaks are one of the rarest breeding butterflies in Nottinghamshire. Their habits and Elm (their larval foodplant) make them much harder to find than the Purple Hairstreak. They are however, almost certainly over-looked and the current Nottinghamshire population, is probably double the current estimate. The privately owned Hare Hill Wood holds a healthy colony. This is centred deep within the wood and was first discovered in 1999 when it held at least 13 adults during the July of that year. Numbers have since remained stable and some seven years later, another colony was found in Lound Wood. Lound Wood is also private and there is no access to the public. The best place to look for White-letter Hairstreaks is from the public footpath at precisely SK709627. Hare Hill Wood lies just north-west of Kersall village and note that most Ordinance Survey maps still show the wood as it was before effectively being split in two by clear-felling some years ago. Take the footpath from the telephone box in Kersall village, walking north-west up to Hare Hill Wood. View the edge of the wood from the farm track only. If visiting during the morning, White-letter Hairstreaks are most likely to be found around the tops of Oak and Ash trees. A more fruitful search may be during the hotter mid-afternoon period. Check any long grass and flowers along the edge of the wood and the set-aside strip running alongside the farm track. Hairstreaks frequently come down to feed at this time. They are particularly attracted to the flowers of Bramble and Privet.